Ariane Rocket - Solar System Planets And Moons Section. Ariane Rocket Blasts Off with Two Satellites. An Ariane 5GS rocket lifted off from Europe's Spaceport in French Guiana today. On board were two satellites: a Syracuse 3A defense satellite, built by Alcatel Alenia Space and a Galaxy 15 communications satellite built by Orbital Sciences Corporation. The satellites were released into their geostationary transfer orbits about 30 minutes after launch. 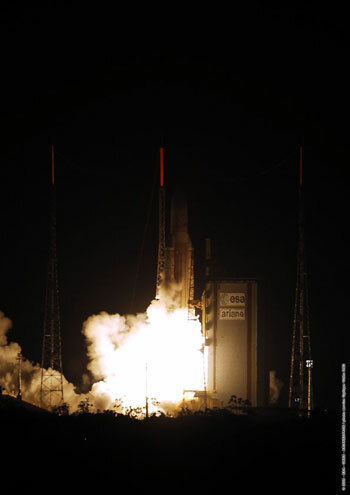 This was the 23rd Ariane 5 launch. Ariane 5 rocket with two Satellites on board. Image credit: ESA. Just after midnight an Ariane 5GS successfully lifted off from Europe’s Spaceport in French Guiana. The two solid boosters ignited 7 seconds after the start-up of the cryogenic main stage, providing the power needed to lift the heavy launcher off the pad.